Do you like to be more productive? Feel like your plans are a waste of time? Do you set your yearly goals and after the first month, those plans have gone out the window? Without you putting in the hard work of tasks, details and deliverables, no one on your team could reach their goals. 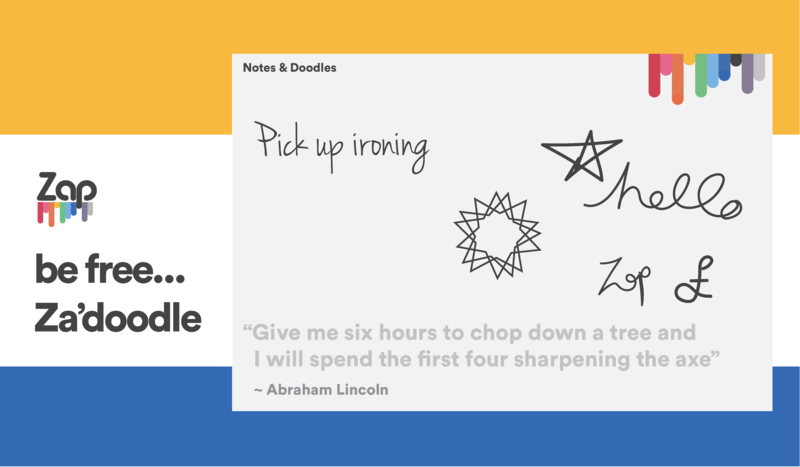 Are you a note-taker? Do you write lots of notes on lots of different bits of paper? Does your work tasks over-shadow your personal tasks? It’s a desk pad with the intention of you achieving your goals, finishing tasks, meeting deadlines, getting those personal tasks done, and successfully creating new positive habits on a weekly basis. But that’s not all. Here’s what each section has been created for. The Za’plan comes with some simple rules. Write down any new habits you want to achieve this week. Eat your 5 a day. Write 1,000 words. Run 1 mile a day. You can decide what days of the week you’re going to do your new habits or write in the days you do our new habits for reflection. I also use this section to write down when my meetings are or when I have personal things I need to do like going to a playgroup with my wife and kids or visiting family members. Lots of uses for one section. 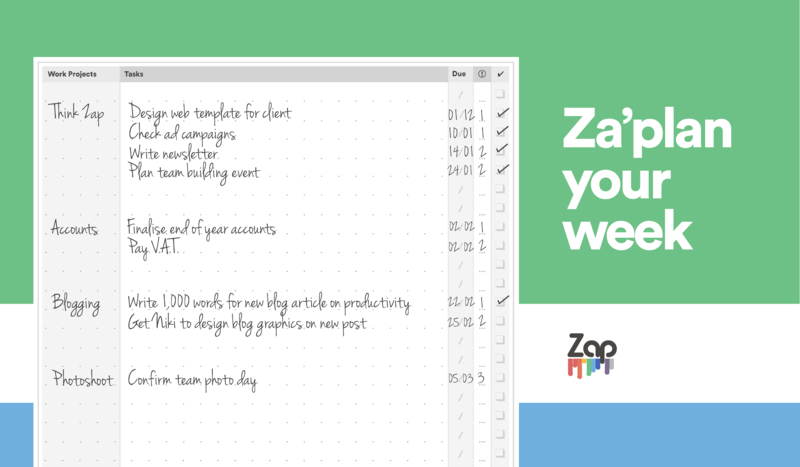 Write down all the projects you need to complete or move forward this week. Then in the next column, write down what tasks you need to do for that project. The project could either be a company you are working for or a certain area of the business you need to work on like marketing or job interviews. 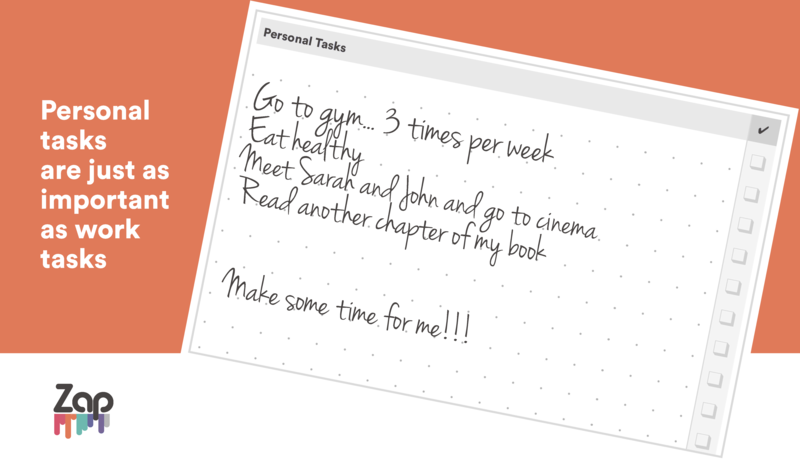 Create a due date and write down a number of 1-3 to set a priority of importance for that task. When you’ve completed the task, tick it and do a little celebration and then start the next task. 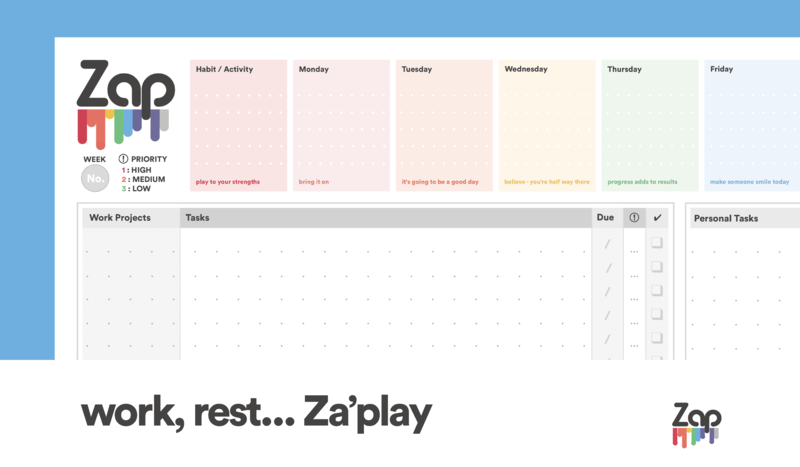 Here at Zap, we all have personal goals just as much as we have work goals. And I know just how it feels when you’ve focused too much on work and not enough on life. Yeah, we do feel our work is our life but when you don’t get to the gym again or work late and miss movie night, it has an effect on your work. Personal tasks are just as important as work tasks. I’m an avid note-taker when at my desk. On phone-calls, doing sums, writing down information from the web and more. Now, I can collate it all into one space. And here we have Abraham Lincoln reminding us of the importance of planning and setting ourselves up to complete the task in hand successfully. It comes in sheets of 50. Nearly one for each week of the year. If you take at least two weeks off a year, it can be used as a calendar. 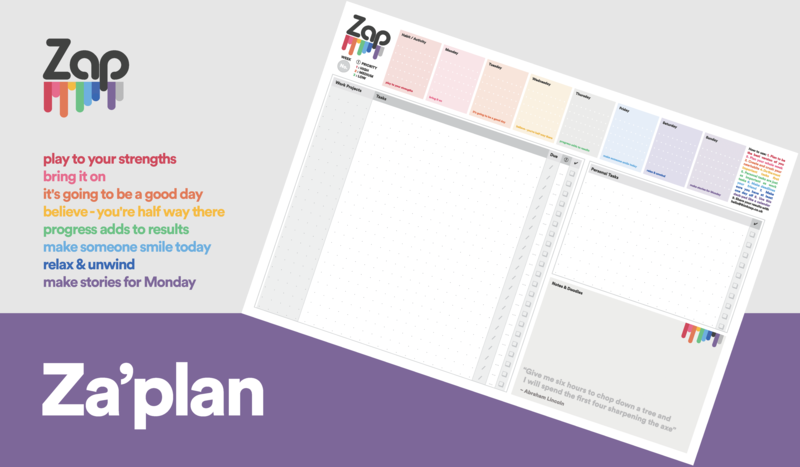 Set out your week number in the top corner and if you have a task that needs to be done next week, write that down on the sheet underneath. At the end of the week, you can see how many tasks you completed. Challenge yourself the week after to complete more. Maybe you’re setting yourself up to fail by adding too many tasks. Keep all the previous weeks so you can reflect back on it in a few months time. We have some of these left and we can send some your way for free. Enter your details to the form below, answer the question and we will send some your way. 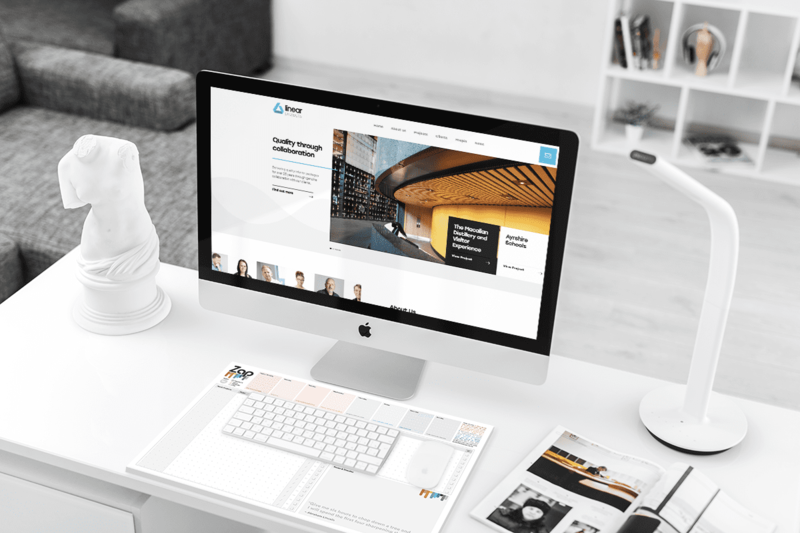 Want us to design one for your business? 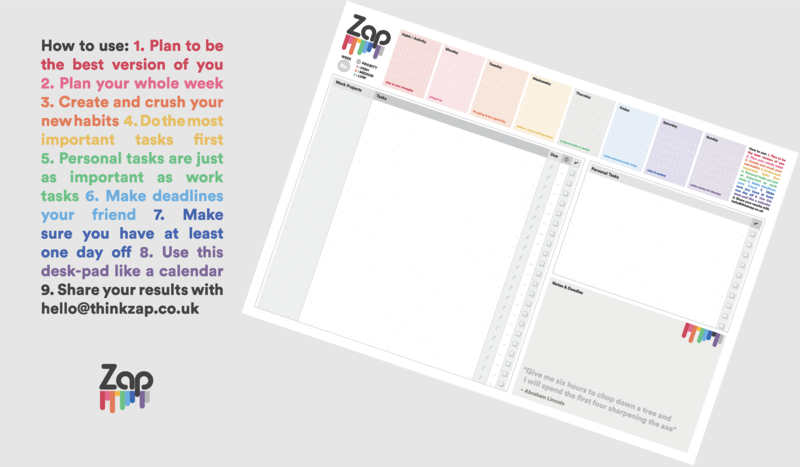 We can change this planner to reflect your own company branding and edit it to suit your business methods. Get in touch at hello@thinkzap.co.uk or use our contact page for a formal quote.